A few years ago I decided to make a miniature version of one of the costumes from Andrew Lloyd Webber’s The Phantom of the Opera. 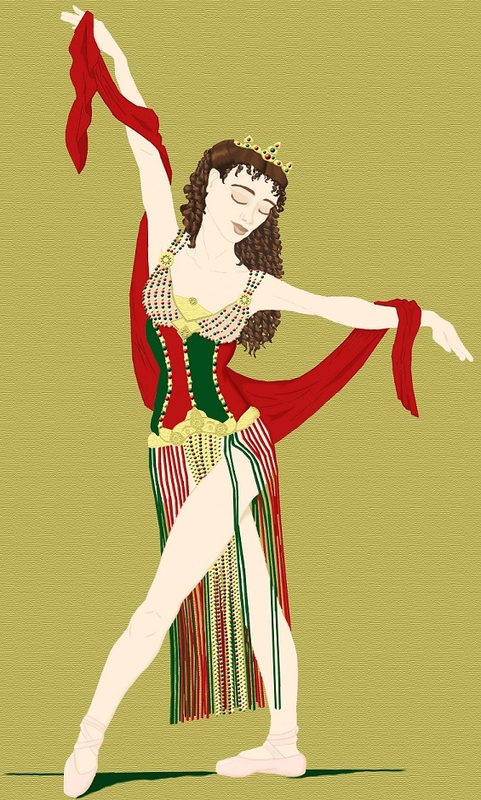 I chose Christine’s red and green ballet costume from the Hannibal ballet. 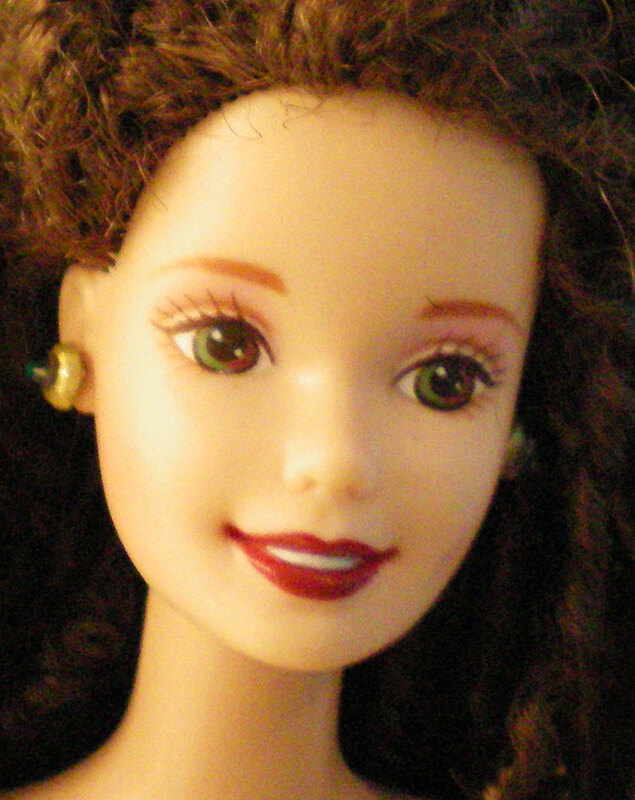 I found a set of Barbie dolls on eBay that included a brunette with an open-mouth smile. Her wide-eyed stare is perfect to depict Christine, as it strongly resembles early performances by Sarah Brightman in the role. This Barbie has long, thick brown hair with a slight curl to it. Her eyes are a curious blend of olive green and maroon. Since they coordinate with her costume, I chose to leave them as they were, instead of changing the color. I knew it would be a challenge to copy such an intricate outfit in miniature, so I gathered photos of the original costume and referred to them constantly. First, I made the body suit. This is a richly decorated, two-toned velvet leotard, in emerald green and ruby red. Since velvet is far too thick for a doll of this size, I chose to interpret it using a low-luster satin. 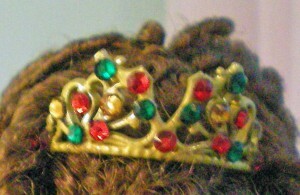 I added a narrow gold braid along the front seams and interspersed it with red and green seed beads. For the neckline and bust, I used small gold bugle beads, along with ruby-colored Swarovski crystals. 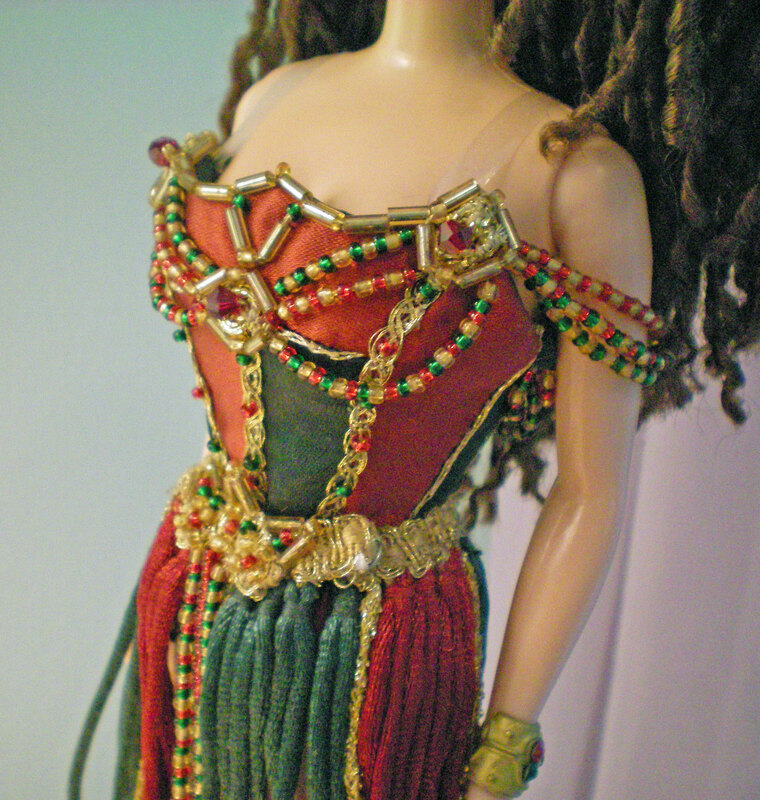 Strands of gold, green, and red seed beads dangle across the bust and shoulders. For the skirt, I made a belt of gold braid and decorated it with clusters of beads. 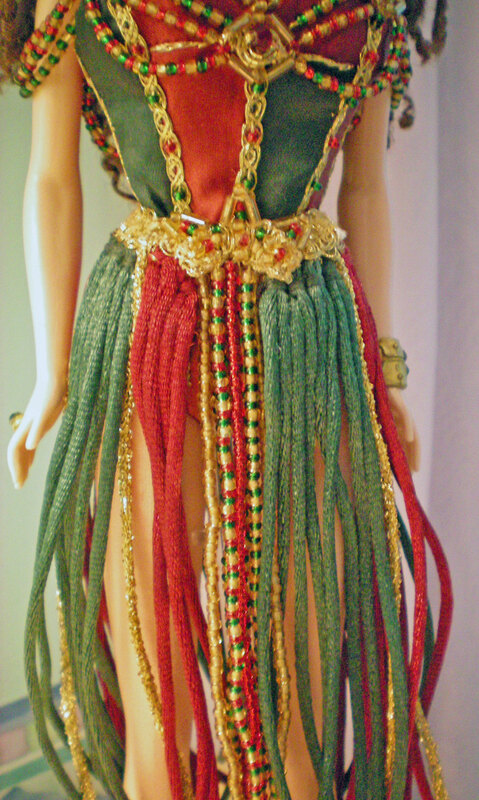 Suspended from the belt are strands of green and red satin cord, along with gold metallic cord. 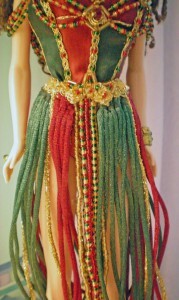 At the front, I added long strands of seed beads to give the skirt some sparkle. 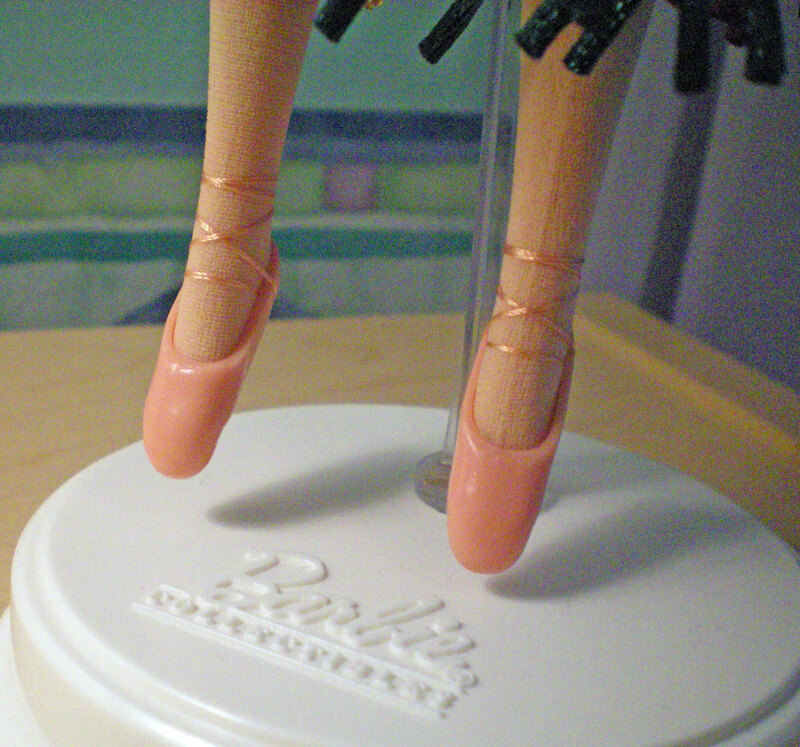 Since Christine dances en pointe in the Hannibal ballet, I purchased a pair of vintage Barbie ballet slippers. They are made of a thin, flexible plastic and are much more realistic than modern Barbie ballet shoes, which tend to be made of hard plastic and do not easily stay on the doll’s feet. Next, I made a set of matching jewelry for the doll to wear, using random Barbie accessories, a metallic gold pen, and some tiny Swarovski crystals. I made a bracelet cuff, earrings, a ring, and a tiara. I had trouble getting the tiara to sit flat on her head—for some reason it kept rising up above her hair. Her hair did not come out quite like I’d hoped, but as it was beginning to frizz, I didn’t want to risk a second boil perm. For the perm, I wrapped strands of hair around pipe cleaners (aka chenille stems) and dunked it in water that had just stopped boiling. The result was a mass of strange-looking solid tubes of hair. It took quite a lot of rinsing with hot water and careful separating of the strands to get these tubes of hair to relax and look even remotely like curls. The problem was, when I wrapped the hair around the pipe cleaners, I overlapped the strands. When you boil the hair, it permanently takes on the exact shape it’s in at the time, so I ended up with solid sausage curls, instead of the corkscrew ringlets I wanted. I should have wrapped the hair around the pipe cleaner with space in between each strand of hair. Now that I know, I can do better next time. I had to trim quite a few ringlets off, because she simply had so much hair. It was extremely poofy! But, with patience, I was able to reduce the volume and produce a look that’s close to what I wanted. I still wish the curls were more corkscrew, but there’s nothing I can do about that now. The finished doll surprised me with how well it turned out. There are aspects I regret, such as the hair, and way the rope strands of the skirt wave at the bottom instead of falling straight, but overall I’m pleased. 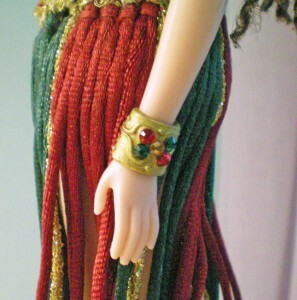 I’m looking forward to making another version of this costume for the somewhat larger Gene doll, so that I can make the beadwork more intricate and detailed. Have you ever made a doll-sized replica of a costume from film or theater? Did it turn out as you expected? What tricks did you use to make it work? 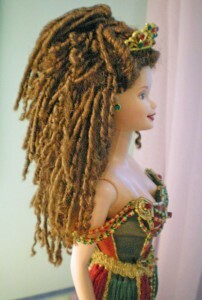 This entry was posted in Wednesday's Projects and tagged Dolls, Phantom of the Opera, Replica, Wednesday. Bookmark the permalink.